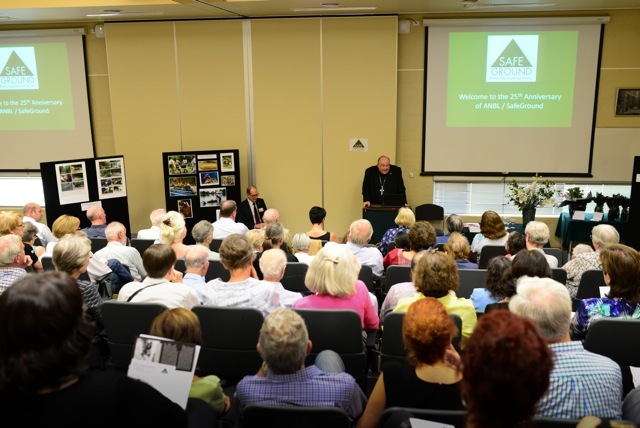 Around 120 people came together in the Mercedes College Lecture Theatre on the 27th of February 2017 to relive the story of the ANBL. Working with the Jesuit Refugee Service in Thailand in 1989 brought Sr. Patricia Pak Poy face to face with the humanitarian crisis on the Thai/Cambodia border due to antipersonnel landmines. On return to Australia, while working with the Catholic Diocesan Commission for Justice and Peace, she initiated a petition signed by 1400 citizens of South Australia. It drew the attention of the parliament to the appalling plight of the Cambodian people being maimed and killed by landmines. The Honourable John Scott MP presented the petition to Federal Parliament on the 27th February 25 years ago. 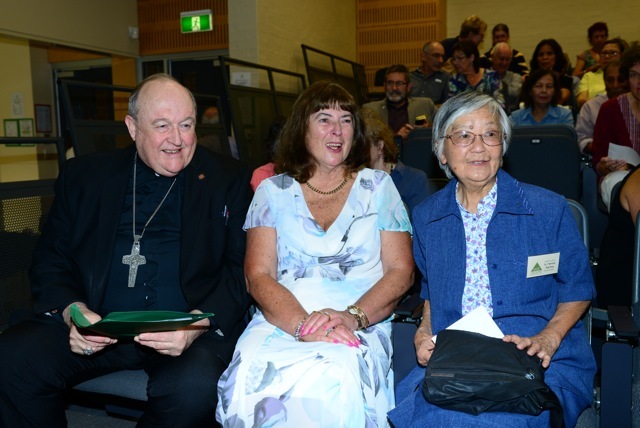 The gathering was opened by His Grace Archbishop Philip Wilson who reflected on the role of the Catholic Commission for Justice and Peace and Sr. Patricia Pak Poy’s contribution in the early 1990s. Helen Stanger, the South Australian Coordinator of SafeGround, researched the early history of the “Network”. Her account reminded us that most people felt disempowered by the enormity of the landmine problem, but for Sr. Patricia it was a challenge demanding action. She famously remarked: “Someone has to do something about this!” and she became that “someone”. She drew together many Australian individuals and representatives of humanitarian non-government organisations to form the Australian Network to Ban Landmines. This Network was closely affiliated with the International Campaign led by Jody Williams in the USA. Sr. Patricia and Jody Williams and their organisations were major contributors to the campaign which culminated in the Mine Ban Treaty in December 1997. As Helen was unable to attend the evening her paper was delivered by her husband, Gordon. To highlight some of the current work of SafeGround we screened John Rodsted’s and Mette Eliseussen’s film ” How long will this bomb stay”. Many of the audience were astounded by the scale of UXO pollution that remains from the WW2 battles in the Pacific. Lorel Thomas, deputy National Coordinator of SafeGround, then addressed the audience, recounting the on-going work of the organisation. When the Landmine Ban was declared in 1997 the ANBL put its energy into achieving a Cluster Munition Ban, thus becoming the ANBLC. Then after widening the field of interest to the eradication of Pacific UXO and the Anti Nuclear Weapons campaign the Network re-badged as SafeGround Inc. Lorel paid tribute to the considerable contribution made by Sr. Patricia until she relinquished the Coordinating role in 2006. The event was fortunate to gain some sponsorship from Minelab Electronics. 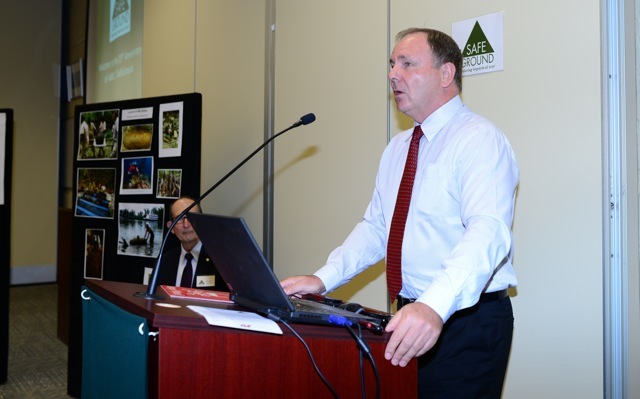 Hugh Graham, General Manager of the Countermine Division attended and spoke with conviction about the humanitarian concern his company has with regard to ridding the world of landmines and UXO. He outlined how the research arm of the company is working continuously to develop even more efficient detection devices. The formal session concluded with the presentation of gifts to the speakers and a special thank you to Sr. Patricia. We then adjourned for supper. SafeGround SA would like to thank Mercedes College for the provision of the venue and catering facilities and all who attended as supporters of this ongoing humanitarian work. We thank Lorel Thomas for travelling to Adelaide to address the gathering. SafeGround SA also thanks the organising committee and their network of helpers who made the event a success.